No matter how much we believe in eating local and seasonal food but its a proven fact that a sight of any loved ingredient which is not in season brings exquisite joy. The same thing happened to me when I saw Nolen gur ice cream on a hot sultry monsoon afternoon. And the joy knew no bound when I discovered it’s from one of my most trusted brand Mother Dairy. I grew up eating their dairy products and follow the same with two kids. Without doubt it’s like our most trusted source of all things dairy. Nolen gur or Date palm jaggery is a pride for me as a Bengali. Everytime someone from other parts of India or abroad visit during winter I make sure to give them a taste of our special sweets made and flavoured with this unique ingredient. But it’s a shame that it could only be enjoyed for a very small period of time. Once the weather starts to warm up a little nolen gur and the delicacies made with it disappears from the market forcing us to wait for another year. 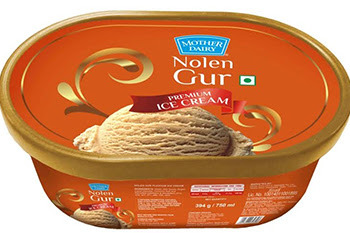 But with Mother Dairy’s Nolen Gur flavoured ice cream available in the market that's not the case any more. You can enjoy the smoky syrupy goodness in a new creamy avatar. Think of a balmy summer evening coming back from a hard day at work and you get a small tub of this that not only satiates your tireness but transports you back to a foggy morning with faint aroma of smoky caramel from boiling down the prized date palm sap. Oh yes! Nolen gur has that power to make you all dreamy and weak at your knees. And this ice cream which is spot on in keeping the balance and is not overtly sweet hits all the right spots. The best part is the signature smoky caramely flavour comes right through each spoonful. OOOOH you got me at the Nolen gur! Yummy. Hope it is available across India. Its always nostalgic to relate to flavours from your childhood when you grow up.